Property developer Dijaya Corp Bhd may replicate its successful RM1 billion Damansara Intan development in Petaling Jaya, Selangor, in Johor in late 2010 or early 2011. "We are toying with the idea. We like what we have in Damansara Intan and believe it will be as successful in Johor. "We are looking for prime land in good locations now," managing director Datuk Tong Kien Onn told Business Times in an interview in Kuala Lumpur recently. The 8.1ha Damansara Intan, launched in 1995, comprises two blocks of 533 office suites and 28 shops, and over 600 units of serviced apartments. Although the Asian financial crisis hit in 1997, Dijaya was able to complete the business park in three years. It fully sold the apartments within six to eight months from its launch in 1998 and 2000. "People like the idea behind our developments. We are providing five-star facilities with added security and after-sales service. We offer more than a work-and-stay environment," Tong said. 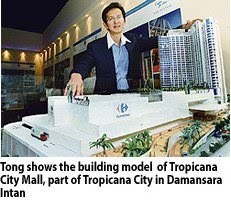 Ongoing developments in Damansara Intan include the integrated Tropicana City, launched in 2006. It consists of the three-level Tropicana City Mall, which has been built and is fully tenanted, the 29-storey Tropics serviced apartment and a 12-storey office tower. The apartment and office buildings are set to be completed by June 2010. Dijaya is famous for its Tropicana brand. Its signature developments are the Tropicana Golf & Country Resort and Tropicana Indah Resort Homes. "We are at the tail end of completing Damansara Intan. While we can do something similar again in the Klang Valley, we want to spread our wings. "The southern region would be the best bet. There are a lot going on in Singapore such as the Marina Bay Sands Hotel & Casino and Sentosa Integrated Resort and, in Johor, we are talking about Iskandar Malaysia. "These developments call for new housing. Investors are also coming in to buy buildings in Johor and we don't want to miss the boat. We will include hotel elements in our plan for Johor," Tong said. Dijaya is preparing the launch of RM1.8 billion worth of properties in fiscal 2010 to expand and sustain earnings. For the year to December 31 2008, it made a net profit of RM34.4 million on RM244.1 million revenue. KUALA LUMPUR: Golden Corporate Heritage Sdn Bhd’s RM1.2bil development to turn parts of Malacca into an Arab City by 2012 is progressing well, said managing director Hesham Fathi. “The pillar structures are already completed on Pulau Melaka as we are planning for the grand opening by March,” he told StarBiz recently. The company, a collaboration between Arab and local businessmen, is transforming parts of Malacca city, namely Pulau Melaka, Klebang and Kg Jawa, into an Arab City after the first proposal to build the project in Klang Valley fell through. The state government has a 10% stake in the project through Chief Minister Inc (CMI). “We feel that the proposed Arab City in Bukit Bintang was inappropriate because of the surroundings. When the Chief Minister of Malacca invited us to do the Arab City in that state, the approval was done in just five hours,” Hesham said. When completed, the RM250mil Arab City project on Pulau Melaka, which is reclaimed land located off the Bandar Hilir coast, will have 240 lots offering products from the Arab world, including 10 restaurants specialising in authentic Middle Eastern cuisines and a museum with genuine Egyptian artefacts. “We are not going to sell or lease these lots as we are going to operate them by ourselves. The completion of Arab City will create about 850 jobs for the locals,” Hesham said. Meanwhile, piling works in Klebang will start in three months for the construction of an Arab healthcare city, according to Hesham. It was reported that the Klebang site, which covers about 4ha and investment of RM700mil, will also involve the construction of a five-star hotel, a water theme park, an aquarium and a floating restaurant. For the Kg Jawa development, Hesham said the site would see an establishment of 12 Arabic restaurants and coffee shops from different Arabic cultures. As the site is facing the Malacca river, it would be “tastefully” constructed with Andalusian-styled domes, he said. “I would like to stress here that the perception of eliminating business people (currently operating) in Kg Jawa and their heritage buildings is not true. What we are going to do is to develop the area and build much better business bazaars for them. By this, we are helping them upgrade their living and income as we are bringing tourists from the Middle East to shop here,” he said. It was reported that on April 2, Chief Minister Datuk Seri Mohd Ali Rustam visited Kg Jawa and agreed that the historical section of the village would be excluded from the Arab acquisition. The state had initially intended to acquire the entire village comprising 84 lots and covering 6.34ha but agreed to scale down the project following protests by the MCA. SIME Darby Bhd will install energy-efficient (EE) building materials such as solar water heating and energy-saving (ES) light bulbs at 13,200 houses currently under construction at its new townships in Selangor and Negri Sembilan. Group chief sustainability officer Puvan J. Selvanathan said each home will be installed with an average of 25 ES bulbs. Compared to an ordinary incandescent bulb, an ES light bulb uses up to 80 per cent less energy and lasts almost 10 times longer. Lighting cost takes up 8 to 15 per cent of the total utility bill per household. By installing the ES bulbs, there will be savings of up to 80 per cent for the lighting cost, Puvan told Business Times in Kuala Lumpur recently. "There will be different EE packages offered to buyers, depending on the type of properties they buy," Puvan said. Puvan added that the policy of Sime Darby was to equip each home with EE features, for branding and product differentiation. "We are looking at EE and environment responsibility. We don't look at it as a cost to Sime Darby but as part of our good business practice. It's an after-sales service," Puvan said. Sime Darby is the first company in Malaysia to embark on EE and sustainable townships. For houses already built and currently occupied, Puvan said home owners can install ES bulbs under its "Switch!" campaign, which will be rolled in a few phases. In the first phase, it is offering 100,000 ES bulbs to 12,500 households at its townships in Subang Jaya, UEP Subang Jaya/USJ Heights, Bandar Bukit Raja, Ara Damansara, Denai Alam, Bukit Jelutong and Putra Heights. Home owners can buy a box of eight (8) ES light bulbs at RM50, discounted from the usual retail price of RM160. There are 65,000 houses within the townships and the remaining households will be offered different packages, Puvan said. "We will engage all the 65,000 houses in different ways over the course of this year," Puvan said. KUALA LUMPUR: The Malaysian Construction fraternity is expected to show a better performance in the second half of this year given cheaper construction materials, said an industry body. Ng: Third and fourth quarters should be quite encouraging. “Third and fourth quarters should be quite encouraging. You can see the number of tenders coming from both government and private sectors,” Master Builders Association Malaysia (MBAM) president Ng Kee Leen told The Edge Financial Daily in an interview. MBAM represents some 3,000 construction companies across the country. Updates by the Construction Industry Development Board Malaysia (CIDB) indicated that a total of RM90.88 billion and RM74.16 billion worth of jobs were awarded in 2007 and 2008, respectively. OSK Research Sdn Bhd analyst Jeremy Goh said builders which had secured projects based on costlier building materials last year could anticipate fatter profit margins this year. This is because the current price of materials such as steel bars has fallen substantially from its peak then, while the value of the jobs secured had remained unchanged. “Although steel prices have rebounded, they are still way below what they were last year. Most of what was secured last year will be reflected in this year’s profits. “We are going to see continued profit margin expansion in the third and fourth quarters of this year,” Goh said. Domestic steel bars are transacted at some RM2,000 a tonne now, up from a low of around RM1,700 a tonne in November last year. Prices of the material had climbed to some RM4,000 a tonne in the middle of 2008 amid record high crude oil prices. While the Malaysian steel sector has been liberalised to allow builders to use imported steel bars, it is worth noting that the bulk of the steel bars used domestically is derived locally due to complexities in importing the bars. Imported items would first have to be evaluated to comply with Malaysian standards before they can enter the country, hence, extra time and money spent to buy these items from abroad. This is in contrast to the mutual recognition agreement adopted by certain countries which recognises internationally-approved steel bars that need not undergo further quality control measures. Recently, local builders spoke out against the amended Stamp Duty Act. The amendment, effective Jan 1 this year, imposes a 0.5% tax on the contract value in ordinary service agreements. The stamp duty rate was previously fixed at RM10. Ng has said the new tax regime results in construction cost rising by between 1% and 2%. Meanwhile, RHB Research Institute analyst Joshua C Y Ng foresees large-scale government projects being deferred further, given its emphasis on dishing out smaller-scale jobs under the two economic stimulus packages within the next one-and-a-half years. These mega projects include the extension of the Putra and Star light rail transit facilities, estimated at about RM4 billion each, besides the about RM5 billion Gemas-Johor Bahru double-tracking railway project. “Also, the government’s recent move to ask Bank Pembangunan Malaysia to fund RM6.7 billion, equivalent to 54%, of the RM12.5 billion Ipoh-Padang Besar double-tracking project may be a tell-tale sign that the government is facing financial constraints in funding mega projects. “All these do not bode well for large construction players,” Ng wrote in a note. The analyst, who is underweight on the local construction sector, also highlighted the possibility of a weak private sector job flow due to funding scarcity against a fragile global credit backdrop. OSK’s Goh, however, argued that private projects constituted a minor portion of domestic construction jobs, hence, no substantial risk to the sector’s growth. PETALING JAYA: Quill Capital Trust’s (QCT) net profit rose 19.8% year-on-year to RM8.09mil for its second quarter ended June 30. According to a company statement, the improved results were due to the full-quarter gross revenue and income contribution from all 10 assets currently under its portfolio as compared with nine assets in the corresponding period last year. Gross revenue for the quarter under review jumped 21.7% to RM16.67mil from RM13.69mil, while gross revenue from the first half of this year surged 33.9% year-on-year to RM33.59mil from RM25.07mil previously. Correspondingly, gross profit from the first half of 2009 rose by 11.5% to RM15.44mil from RM13.85mil in the same period last year. QCT is a commercial Real Estate Investment Trust (REIT) managed by Quill Capital Management Sdn Bhd (QCM). Currently, QCT owns 10 buildings comprising five in Cyberjaya, two in Kuala Lumpur, and one each in Shah Alam, Petaling Jaya and Penang. According to QCM chairman Datuk Mohammed Hussein, QCT will distribute 3.78 sen per unit for the six-month period ended June 30, which is 12.5% higher than the last distribution per unit of 3.36 sen.
Chief executive officer Chan Say Yeong also revealed that QCT has secured in advance a RM80mil financial facilities from Great Eastern Life Assurance (M) Bhd and Alliance Bank. “The facilities will mainly be used for repayment of a bridging loan which is maturing in November 2009. “With this, we would have completed all of QCT’s refinancing requirements for this year, and there will be no refinancing needs till December 2010,” he said. KUALA LUMPUR: Investors are pricing in potential gains in sectors which are deemed beneficiaries of the massive four trillion yuan (RM2.07 trillion) stimulus package in China. In anticipation of an encouraging outloook in the medium term, three sectors are expected to perform — consumer, financial and property, according to UOB Kay Hian (Hong Kong) Research analyst Elvic Ng. Ng foresees private sector investment and consumer spending gaining momentum in the second half of 2009 and contributing to the economic recovery in China. In a note, Ng wrote that corporate earnings downgrades in China had been reversed in April this year, and an upward revision could be expected for financials in the banking, coal, metal and property sectors there. “We believe China stocks are still in an early stage of a new multi-year bull market because of a steady consumption-driven economic expansion in the medium term, low interest rates, abundant domestic liquidity, and declining risk premium. “Those who are long-term bullish should focus on consumer, financial and property stocks,” Ng said. Consumer product companies are expected to benefit from policymakers’ intention to boost domestic consumption from 49% of gross domestic product (GDP) to some 80% by 2020. At the same time, an expanding distribution channel in the form of retail outlets is anticipated to enhance the sale of consumer products. Within the financial services industry, it is worth noting that China’s life insurance market has a low penetration rate of 1.8%, compared with 9.6% in Japan, 11.8% in both South Korea and Hong Kong, and 15.7% in Taiwan. Meanwhile, banks in China are expected to see an expansion in retail activities and fee-based income operations like investment banking and wealth management over the next few years as the economy continues to grow. Real estate is another sector to watch as rapidly increasing personal wealth and urbanisation prompt demand for houses. The research firms’ top five medium- and long-term picks include China Life Insurance Co Ltd, China Merchant Banks, China Overseas Land & Investment Ltd, Hengan International Group Co Ltd, and Hong Kong Exchanges and Clearing Ltd. Meanwhile, CLSA Asia-Pacific Markets analyst Francis Cheung said while China posted an impressive 7.9% annual expansion in its GDP for the second quarter of this year, a notable concern is that the growth was spurred mainly by investment rather than domestic consumption. “The weak consumption growth explains why the government has repeatedly stated that the economy is still not stable and monetary policy will remain ‘moderately loose’. Loose monetary policy will continue to fuel asset inflation and the stock market. “The economy is not as strong as the headline numbers report and the government will likely err on the side of safety. An investment-driven recovery is not sustainable unless private consumption also increases,” Cheung wrote in a note. CLSA foresees a major improvement in the soon-to-be-announced second-quarter earnings, particularly in sectors which are deemed beneficiaries of the government’s stimulus package. These include the automotive, property, construction and consumer product sectors. However, the telecommunications, steel and banking industries could see pressure on their profit margins, according to the research firm, whose list of potential performers include Angang Steel Co Ltd, China Shenhua Energy Co Ltd, Dongfeng Motor Co Ltd, Jiangxi Copper Co Ltd and Shanda Interactive Entertainment Ltd.